It was amazing to see the sunrising this morning, and look at the beautiful artistry of Jesus. All the colors swirling together, as a reminder that even in the sunrise God takes great care of his children to make sure they see the goodness in him. 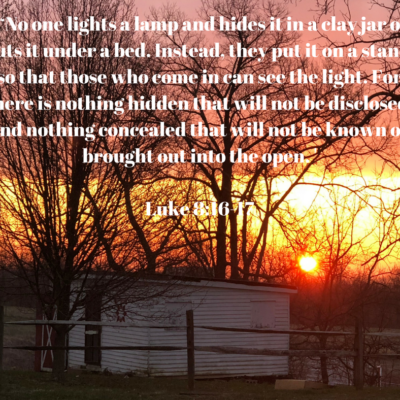 There is a good correlation with the sunrise and today’s scripture. 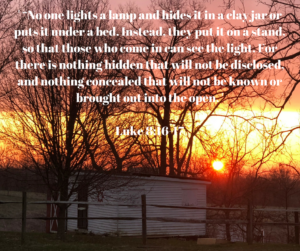 When it comes to the Kingdom of God, or the Sunrise, God would never make those and put them under a bed where no one could see. Instead, he puts it on display, on a lamp stand, in the sky, for us all to see what is going on. You can’t hide something so beautiful and thoughtfully put together by a creator. As we saw this morning, when those things are beautiful, like the sunset and they are on display for all to see it is a great thing. However, when those things start to look bad and they are on display it is not a good thing. Sometimes, we call out our Christian life and then live like we don’t know who Jesus is, we put on display a life that would make anyone outside the church run in frustration. This morning, remember, the life you are living is on display for all to see. Somewhere, someone is watching to see what you, the Christian, will do in times of trouble. How you will react when things get hard and decide how they feel about the Gospel based upon that. Live a life for God today!